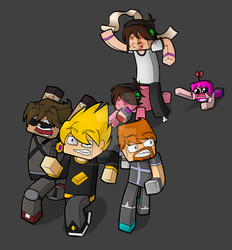 GoldSolace has started a donation pool! I'm an 18 year old Australian male by the name Brice (aka GoldSolace, Solace, CheeseSolace or ButterSolace). I'm a youtube artist, animator and commentator. How much is it for a commission? It depends on what specifically you're asking for but typically ranges from $30-50 for a basic avatar, single character to $100+ for full banner, wallpaper, multiple characters. How long did this (speedart/intro) take to create? Varies from 1 hour to a couple of days. What are your YouTube channels? Are you so and so on <insert game/website here>? Can you do <blahblahblah> for free? No, I can not do anything for free. It's rude for you to come up to me and expect me to use my valuable time for free. Where can I get your skin from? Why do you like cheese so much? Because cheese is the most amazing substance known to man. I mean come on how can you not like cheese? Not yet but I will eventually make one. and if you can just rep lie back and thanks! hey bro can would you be able to do my oc for my youtube channel? Hey I really LOVE your art! do you think you could make me a picture? your art is amazing! BEST HALF YOUTUBER HSLF DEVIANTARTER EVER!!!!! Do u wanna do a collab? Do u wanna do a colaaaaab?